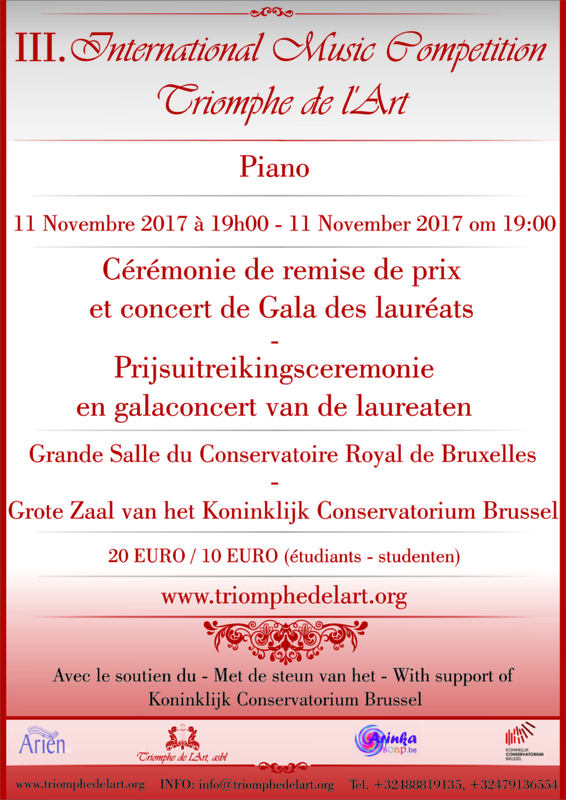 Dear public, if you want to hear winners and laureates in 3 different categories (solo, 4 hands, piano accompaniment) live at the final concert of the competition, you are very welcome to the Big Hall of Royal Conservatory of Brussels. Around 40 participants from 15 countries (Belgium, USA, Holland, France, Japan, Greece, Croatia, Spain, Italy, Macedonia, Russia, Australia, China, Serbia, Czech Republic,) will compete for a week in 2 categories (solo and 4 hands) and in 3 age groups. Do not miss this unique concert in Brussels on 11th of November at 19:00! Come to hear the future piano stars of the world! We are looking forward to see you at the concert! Presale by bank transfer: You can book tickets by making a bank transfer to the account BE03 5230 8069 5284. Be sure to put your last and first names and the date of the concert in the communication. You will find your name in the list at the entrance. Attention! Limited number of seats. Hurry up to book tickets! Tickets are also available for sale at the Box Office of Bozar by address Rue Ravenstein 16, 1000 Brussels or at the call center +32 (0) 2 507 82 00. Booking and information: +32479136554, +32488819135.